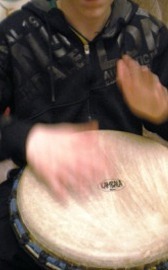 Choosing the right drums and percussion for yourself is very important and very personal. Whether it's a djembe, surdo, bougarabou, pandiero, agogo, darabouka, congas, bongos, cajón or tabla; you need the right instrument for you. a. Just because it's made by a particular manufacturer does NOT mean that you will be satisfied with it. b. Buying a drum that is the same as someone else's (make, size, model) does not guarantee that your drum will sound anything like theirs. Because drums of ethnic origin are not mass-produced. Each one is an individual. Each one sounds different. Ten drums of the same size and model, made by the same manufacturer are likely to sound completely different. Because their shells will be slightly different dimensions and thicknesses, made from different trees with different densities, use skins from different animals with different thicknesses and importantly, they will be tuned to and settle at a different tension. So simply stating, "I want a Kambala KDJ103 10-inch professional djembe" is a bit meaningless! Ideally, you need to know what you want sound-wise, because Kambala 'KDJ103' djembes will almost certainly come in a wide range of tones and sounds. a. Do you want it to sound bright, dry or warm? b. Full of bass tones or mainly high tones? Consistency may be better in metal-based instruments but each instrument still sounds different; each instrument is an individual in its own right. To buy drums from us, visit our drums & percussion sales page.